Mythology has always been a popular subject of metal. Of these, Norse legend is the first and foremost, to the point of cliche, by anything ranging from cheesy power to pummeling death metal. But Sumerian and Egyptian have their fans as well, and even a few Asian and South-American wellsprings have proven fruitful. One underused source of ancient stories is that of Native American culture, a loose collection of mythologies of the many tribes that once roamed the North-American continent, which often worshipped the great beasts of the plains and the elements that provided for them. 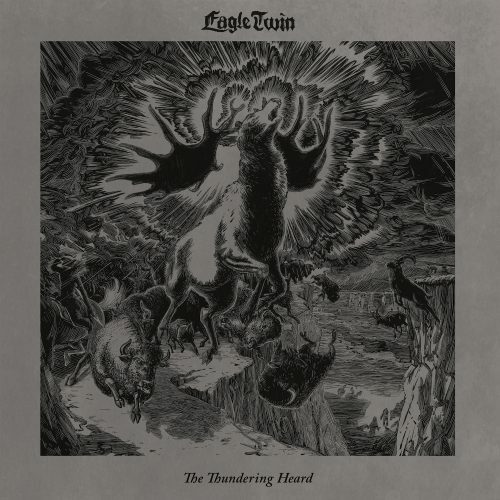 Eagle Twin, consisting of singer/guitarist Gentry Densley (Iceburn) and drummer Tyler Smith, sought to correct this lack of appreciation with the Native American inspired The Thundering Heard (Songs of Hoof and Horn). 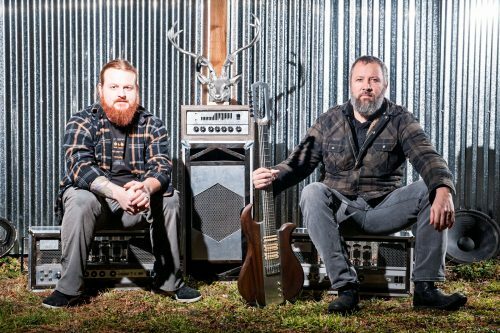 Mountainous animal gods require heavy music, and on that front, Eagle Twin deliver. “Quanah Un Rama” (likely after Comanche war leader Quanah Parker) thrives upon a grand, burly riff that shakes the Earth. The one riff goes through numerous mutations, but once it starts, it does not stop. Ragged, shredded and buzzing, the omnipresent guitar tone suits the primal theme, and when it’s layered upon itself with solos that seem to tear the instrument apart it creates a thick tribal fog most pleasant. Atop this hefty backbone sits Gentry’s less than sultry voice. A not inaccurate simile would be Tom Waits meets Lemmy in a mood for sludge. The shamanic voice emerges from the back of a whiskey-filled throat and imbues the music with tons of personality. Going from a gurgling belt to the gruff hush and drone of a medicine man bent on ominous prophecy, the vocals are easily the strongest and most recognizable element of the music. The songwriting does not disappoint either. Follow-up “Elk Wolfv Hymn” gradually builds in intensity over a long stretch, using repetition (“The crow keeps watch” being a key phrase) to its advantage, holding the arc of tension tightly wound. With its opening stanza, actually using “clips” and “clops” to refer to the title, “Heavy Hoof” initially threatens to overdo the silliness but it quickly redeems itself with an energetically churning riff and grimy, broken guitar solo. Only “Antlers of Lightning” drops the ball, exhausting as it is with its reduced pace and somewhat bloated length. The song has a pleasantly ominous atmosphere but doesn’t have enough focus on evolution to remain interesting for almost 15 minutes. The biggest stranglehold on the album is, sadly, the production. Louder does not equate heavier, but no one told Eagle Twin that. At some level, the dense master and crushed fuzz works, but it is far too much to be a good thing. At sufficient levels, it feels like the sound vibrates behind my eyeballs, and not in a good way. When the riffs dive into the lower registers, it becomes hard to make out any tonal progression through the ragged reverberation. The biggest disservice is done to the drums. Whereas the tribal theme calls for big, booming bass drums and tom rolls, the reality lands with disappointing thuds and an unimpressive snare. Only the cymbals seem largely unaffected. The guitar and vocals largely overpower the drums and the less than remarkable buzz of the bass. It’s a shame because the music has a strong tribal appeal and solid songcraft to back up its theme. With Gendry’s voice so rich in personality and the riffs so joyously crushing, few things could bring The Thundering Heard down, but the potential for migraines will surely make potential fans think twice and may drive some away before the first spin is at an end. It’s a blow, but not a mortal one. Eagle Twin have done well in carving out a little niche for themselves, avoiding the worst of the tired tropes of sludge and stoner. If they don’t try to throw all levels to 11 in the future, the next installment is sure to be killer.